Virginia-Highland is one of Atlanta's most charming neighborhoods. Comprised of seven commercial areas, the area is a walking friendly community in the heart of the city. With an array of dining and shopping options, there is never a dull moment in Virginia-Highland. Nestled amongst these unique shops and progressive dining spots are quaint cottages and bijou homes. Named after the intersecting streets that cross in the middle of the area, Virginia-Highland is centered around the lively action of the community and its visitors. Living in Virginia-Highland comes with all the perks of an inner-city lifestyle, complete with the ability to be able to walk to the local amenities, entertainment, and dining for which the area is known. Although it's often called by its moniker VaHi, an indication of its trendy nature, the community is a close knit one, with many residents participating in on-going volunteer activities and events. The Virginia-Highland Civic Association is a source for residents' community news and events, as well as local history. The association hosts summer festivals and an annual tour of homes, among others. Homes for sale in Virginia-Highland area blend of old and new, with historic bijou homes seeing exquisite maintenance from the owners and the new homes reflecting the neighborhood's classic architectural styles. The area is predominantly single family bungalows, most taking on a Craftsman style aesthetic. 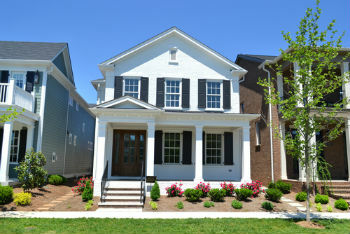 Beamed porches, custom iron bannisters, and plenty of natural light are key to the houses in this community.